Justification as provided to Congress is here. The proposed budget includes $5.759M in FY2017, $25.984M in FY2018, and $24.982M in FY2019. The round is expected to be operational in 2020 (about the time the first OPC comes out). A US Naval Institute News story, “Wrapup: HASC Passes FY2017 Defense Bill With Reagan-Era Spending Levels,” indicates House Armed Services Committee interest in speeding up the program. Sounds like the Coast Guard should have a few of these rounds as well, both for small, fast, highly maneuverable targets, and to target specific areas on larger targets. We had some indication this was coming before. “L3 Mustang’s ALaMO program has successfully demonstrated this capability in tests at the U.S. Navy’s Potomac River Test Range in Dahlgren, Virginia, by hitting a moving surface target at significantly longer ranges than possible with unguided projectiles. 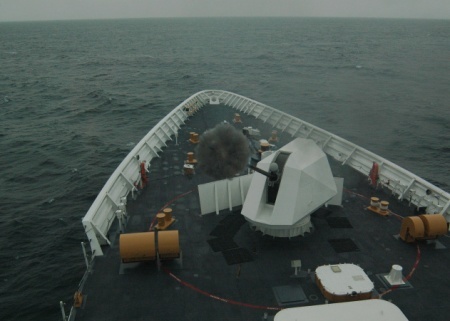 This improved accuracy allows for a significant reduction in cost and adds depth to the ship’s magazine by requiring fewer rounds per target.